No-dig (or no-till) gardening is exactly as the name suggests; gardening without digging the soil. Once a bed is established, the surface is left undisturbed except to add new seeds and plants. Compost, manure and other soil amendments are added as mulch to the surface of the soil. The earthworms and other life in the soil will do the work of pulling these down into the subsoil. No-till gardening mimics natural conditions under which most soils are formed. No-dig gardening and farming are becoming an increasingly popular method across the world. 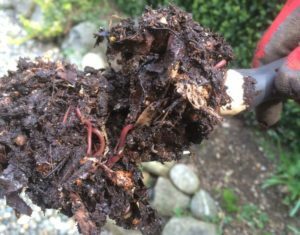 No-dig gardening supports the microbes and life in your soil and therefore goes hand-in-hand with bokashi composting and using essential microbes (EM) in your garden. In no particular order, here are our top six benefits of adopting the no-dig gardening method. Healthy, productive garden soils support a diverse soil food web and the complex, symbiotic relationships between micro-organisms and plant roots. Hairs of mycorrhizal mycelia fungi, finer than the smallest root hair, act as crucial pathways transporting nutrients, moisture and carbohydrates through the soil to plant roots. Digging and tilling the soil damages and disturbs this intricate web of life. When soils are left undisturbed, these soil organisms can thrive. In turn, more balanced populations of soil biota exist in no-dig gardens meaning that there is a more natural balance between soil pests and predators. No-till soils (and plants grown in them) have been found to be freer of pests and diseases. As mentioned above, using no-dig gardening promotes and supports a healthy and diverse ecosystem in your soil. A thriving population of life in your soil is important for a healthy soil structure. Tunnels created by worms and bugs provide aeration and drainage, and their excretions help to bind the soil together. As such, lots of life in your soil helps improve drainage, water retention and reduce soil erosion. In addition, using the no-dig technique, mulch is added to the surface in layers. These layers of mulch help the underlying soil remain soft, allowing young roots to easily work their way through the soil. When soil is dug, dormant weed seeds are brought to the surface. Here, they are exposed to sunlight and are able to germinate. However, if these seeds are left undisturbed under the surface of the soil they will remain dormant indefinitely. This does not mean that you will get no weeds using the no-dig method. Some seeds will reach your garden on the wind and or by birds. However, in no-dig gardening, the need for weeding is largely replaced by the use of mulch. Whether you usually dig your soil by hand, or using a powered tool, you’ll save time and energy by not digging. Although time is needed to regularly apply mulch to the garden, overall, the no-dig method is less labor intensive. In no-dig gardens, compost and other organic materials are added to the surface of the soil in layers (mulching). These layers help to shade the soil whilst allowing water to easily pass through. Mulching is a great way of reducing water loss from soils and maintaining a moist environment which is beneficial to healthy root growth. Water restrictions are becoming an increasingly common pressure for gardeners and farmers worldwide. As such, it is important for us all to start adopting methods to help our gardens thrive in times of drought and reduced water. Healthy soils are rich in carbon-based humus and decaying organic matter. As these organic materials break down, they release essential nutrients into the soil. Digging the soil speeds up the decay of the organic matter. This increased decay has two negative effects on your soil and plants. Firstly, increasing the rate at which the organic matter in your soil breaks down can leave the soil depleted of organic matter. Without sufficient organic matter in the soil, plants struggle to get sufficient carbon-dependent nutrients which they need for strong, healthy growth. Secondly, digging the soil causes nutrients to be released quickly into the soil. This quick release of nutrients is not ideal for plant growth. Instead, plants need a steady, slow release of nutrients to thrive. No-dig soils naturally release nutrients at the desired slower rate. The secret to a successful no-dig garden is frequent mulching. Mulch acts as protective layer, locking in moisture, suppressing weeds and protecting against erosion. Mulch is also the key way of adding organic matter and nutrients to the soil. In a no-dig garden, mulching replaces digging. Mulches include compost, leaf mold, wood chips, grass clippings, sawdust and straw. Add mulch regularly as old mulch becomes incorporated into the soil. Choose mulch materials that are free of weed seeds, otherwise the addition of mulch as a weed suppressant can be self-defeating. Keep mulch layers to only a few inches deep when first planting seedlings and smaller plants. Make sure that the mulch is pulled away from the stems of plants such as tomatoes and peppers. Thicker layers of mulch, up to 24″ deep, can be added to bare over-wintering beds. Mulching helps the soil retain moisture and therefore reduces the need for frequent watering. Reducing watering will also help prevent soil compaction and germination of weed seeds. If your soil becomes excessively compacted, then you may need to break up (ie. dig) the surface of the soil before being able to plant in it. This defeats the aim of no-dig gardening! Firstly, be careful not to step on your beds as this will compact the soil. Using smaller (possibly raised) beds of less than 4 feet wide reduces the need to step on the soil. If your beds are larger, consider using boards or stepping stones rather than stepping directly on the soil. Secondly, make sure that the soil surface is covered with a good layer of compost, or other organic material. If the soil surface is exposed for long periods of time, direct watering and heavy rain can compact the soil surface. Bokashi composting goes hand-in-hand with the no-dig gardening approach. One of the huge benefits of bokashi composting is that it feeds and supports the essential microbes and extensive web of life within our soils. No-dig gardening complements this by ensuring that the established ecosystem in your soil is not disturbed and damaged by digging and tilling. A common question we get asked is how can the no-dig method be applied when using bokashi composting? In order to use the bokashi compost as mulch, the bokashi pre-compost can be added to a compost pile or a soil factory. The finished bokashi compost can then simply be added to the surface of your no-dig beds in exactly the same way as any other mulch or compost.